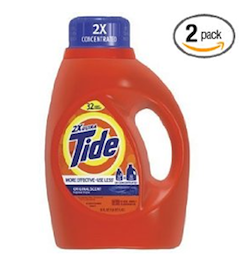 Amazon is currently offering up a great deal on Tide detergent! After all the discounts, you can score two bottles for only $8.79 shipped, or $4.39 per bottle! Go here to see the Tide. Click the ‘Clip This Coupon’ button to save an additional $1. Choose the Subscribe & Save option to the right. Enter coupon code LAUNDRY7 to save another 15%. Pay $8.79 + get FREE shipping! Once your order ships, go to ‘Your Account’ and click on ‘Manage Subscribe & Save’ to cancel future shipments.